Its been said that the follicular unit extraction is a new method which is better then the strip method. Today doctors with very little experience tout their newer method with an even smaller punch but at the expense of destroying adjacent donor hair. So for every 2 hairs removed from the donor site you could destroy 4 to 6 hairs and you are still left with scars which will show if you do subsequent sittings. This is ridiculous. Also the same amount or more anaesthesia is used and the procedure takes longer. With the strip method, rather than taking a shotgun approach to removing and destroying donor hair, the strip can be removed in less than 5 minutes and then dissected under a microscope or high powered loop which preserves the donor area. 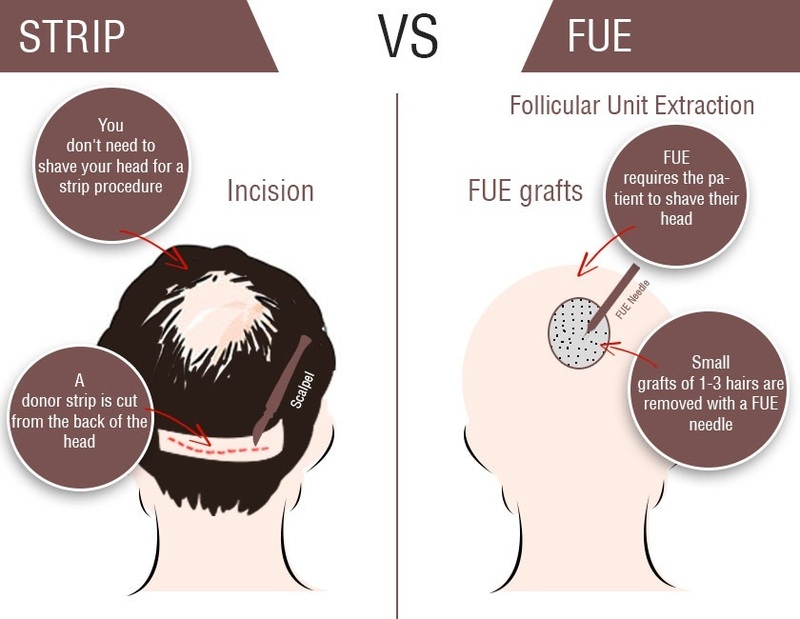 So before considering the FUE, be sure to ask your doctor about the downsides. Now FUE do have limited use in patients who have poor quality donor area with limited elasticity. But one size does not fit all and an experienced doctor has all the options available for you. Some doctors who dont do strip at all do not have the staff for the strip. So be careful that they are not steering you towards this option because they can charge more for a so called new procedure. In eighteen years of practice we have seen plenty of patients who have done work with other doctors. They always ask what do you think of my prior work? Did they do a good job? We feel it is completely unethical for a doctor to comment on another doctors work. Understandably it would be very difficult for a doctor to not have strong feelings about the quality of another doctors work, but it is not appropriate to discuss these due to the obvious conflict of interest involved. Its pretty hard to be neutral about something about which one is passionate but it is important to do so. On the other hand, medical boards, consumer advocates and individual consumers have and do discipline doctors, complain on forums and blogs (both with and without merit) and even start websites detailing the false and aggressive advertising, no-refund policies, running call centers manned exclusively by salesmen, etc. We recently came across a website detailing the aggressive and misleading practices of one major hair transplant clinic chain but for the very real ethics and conflict of interest issues do not specify which one. At Dr. Shakils hair clinic we try to stand on the results. Dr. Shakil has years of experience, focuses on his specialty exclusively, has support staff who, again, focus on that specialty exclusively, and takes the time to address your concerns and questions. Because he stands behind his work, youll be able to talk to patients and even watch a procedure but in the end, youll be able to make your own decision without pressure.